Hopefully by now you are familiar with Bobbie Lou’s Fabric Factory – it’s one of my favorite online fabric shops because of it’s very unique selection of colorful, modern and contemporary fabrics. This shop is owned by Chelsea who named it after her grandmother who loved to sew, Bobbie Lou. Bobbie Lou’s just moved from an Etsy shop to a new online shop. It is not only pretty, but so well organized and easy to navigate. Fabric can be searched by Manufacturer, Design, Color and Style. 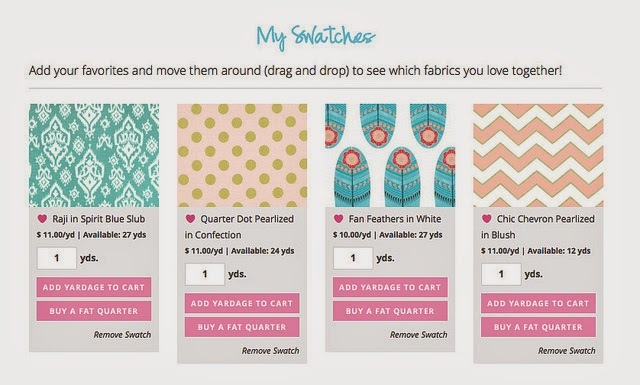 One of the very coolest features is you can sign up for a free personal account and save “swatches” of fabrics you like to your own page and then drag the swatches around, mixing and matching. So cool – and such a great way to keep track of things you see along the way and want to remember. You can order fabric in increments of 1/4 yards, including fat quarters. and Nightfall from Camelot. Bobbie Lou’s carries some really fun, distinctive prints including a great selection of Novelty prints. Bobbie Lou’s offers free shipping on any order over $50 in the US and discounted shipping internationally. You can keep up with the latest arrivals or sale announcements by following @BobbieLouFabrics on Instagram. Today Chelsea is generously giving away 3 yards of fabric from Bobbie Lou’s! And that can be 3 continuous yards, or an incremental combinations that you choose (i.e. 12 fat quarters, 6 half yards, etc.) Pretty awesome if you ask me. To enter take a quick trip to Bobbie Lou Fabric Factory and leave a comment here sharing something that you love. Giveaway open until Thursday, July 17 at midnight MST. Good luck! GIVEAWAY CLOSED. I love the Emmy Grace fabrics from Art Gallery. I only recently discovered her work, and it&#39;s just so darn pretty. I love Witch Stars in black. Thanks!<br /><br />Please click on the delaineelliott above for my email link. Leaf Press in Teal is beautiful! Snappy snacks! I&#39;ve never seen that print before and it&#39;s so my bag. The swatch feature is great….. I like seeing it all in one place. Thanks for the giveaway! Oh….I do love my Ghastiles! So much to love. I love the new arrivals page. Arrows in grey and the Eccanacia flowers by Anna Maria Horner! Love the knits, especially the Tomahawk strip! I like Lotus Pond by Cloud 9. The aqua and navy look so pretty together! I&#39;m a sucker for birds on fabric; I like the &quot;flock&quot; prints by Michael Miller. I really love that she only sells fabric that she loves…What amazing taste she has! I love all her fabrics, I cannot pick just one! I love the aqua candy claus fabric – so cute. Oooo, lots of great fabrics! Anchors Away in Navy would make a fun dress! So many wonderful choices. I do like Menagerie the best though…I think. Lovely shop! I really like the swatch feature – so useful. I&#39;d love some Cottage Treasures in Pink. Thanks so much to you and Chelsea for the chance to win! I love her whole shop and I especially love her flat rate shipping! I love browsing her sale bin. Wow, lovely stuff – my favorite is Rustique. Thanks for the chance to win! Night fall is beautiful. Thanks for the chance. Love the Flight collection – thanks for the great giveaway. I love the new shop! The new fabric on my wish list is Art Gallery&#39;s Meadow collection. All this temptation!! Thank you for the chance to have some of my very own. I love so many of the novelty prints: the Rustique collection, the Animalia in Splendor, Fly By in Day, and many others. I like the Open Season prints and all the prints with woodland creatures! Nice selection on her site! Thanks for the giveaway! I love Flock and Brambleberry! Great website. I adore Flight and Brambleberry!! Thanks for the chance! LOVE this shop! And I LOVE Arizona! I am loving the Day of the dead stuff….. Got lots of plans for those type of goodies. Love, love, love that Timber Valley stack from Brambleberry Ridge. I will be making something for ME with that line! I love cotton treasures. Love this site. I will be ordering. The Nightfall collection is beautiful! I love it. I am loving Brambleberry Ridge by Violet Craft, especially Rosemilk in Cameo. I would love a tote in that! The Ripples and Stitched Road designs from the Emmy Grace Collection by Bari J. Also, Arrow by Premier Prints. PS – This shop needs some fabric bundles!!! I love that she has so many modern fabrics, and that you can shop by color. Thanks for the introduction! Too many pretties to choose one! I like the Pretty Potent yardage! I love the Rustc Brambleberry, stunning! Nice shop too! This is a shop I will be coming back to. I love the selection and the way the site is organized. Thank you for the opportunity to win. Love the new shop and Candy Clause and Arrow in cool grey and …..so and so on love them all. I love the ability to search by style. It was fun to see how the fabric was classified that way. What a great shop! I love Arizona! Wow these are great fabric designs! The birds in flight really caught my eye. Timber valley is gorgeous! I&#39;ve not seen that one before. Thanks for showing me a new store! I&#39;m really loving the Brambleberry Ridge prints as well as all the gold printed fabric. Thanks for the fabulous giveaway! The new site is beautiful! I am in love with Arrow in Candy Pink. Love the Arizona collection. Thanks for a very generous giveaway. Are you freaking kidding me?? There is actual Frida Kahlo fabric and I wasn&#39;t aware of it??? Bobbie Lou Fabrics is now my official favorite because of the Frida La Catrina in Dark Marine line! Love it! Love the new Michael Miller Candy Claus in Aqua! So cute! Camelot Nightfall is so gorgeous and I can never pass up lovely yellows, Tarika is a wonderful geometric. thanks for the wonderful chance to win fabric! I love the echinacea prints. Also, at the opposite member of the spectrum, the Alexander Henry prints. I love the new Brambleberry! Loved Aloe in Candy – can&#39;t resist aqua and pink together! Thanks!! Nightfall by Camelot. I&#39;ve never seen anything like it and I am in love! I love the Flight collection&quot; thanks for the chance to win! Fun, bright colors! I love the rose milk and sailor patterns especially–in all colors! LOVE the Agave Field print in agave. So many new things. I can&#39;t pick just one! The site is really easy to navigate and who doesn&#39;t LOVE free shipping. Love Flower Fields in multi! Alexander Henry&#39;s Day of the Dead line. Dont see them in upstate New York! I love the Arizona line of fabrics, thanks! I love Anna Maria Horner&#39;s Eucalyptus in Jade. I would use this to make a weekender bag. Thanks Amy and Chelsea! I love Michael Miller&#39;s Socks the Fox and Les Amis; also I like their coordinating fabrics suggestions. I loved the Bobbie Lou site and signed up for her newsletter. Also added some of the Echinacea fabrics to my wish list!! Flock in White is adorable! Something about colorful birds on fabric that pulls at my heart! Thanks so much for the chance! No need to go anywhere, as that Nightfall line from Camelot is perfect! I love the Arizona collection by April Rhodes. They are all so pretty! I&#39;m making a nautical quilt, so the anchor one is catching my eye. I love the Bobbie Lou website – period!! Thank you for the kind offer. So many fabulous fabrics to choose from! I love the echinacea and flight in all the colourways ( especially the gold birds) and those deer as well. I am so glad I had a look, I completely surprised myself – I have never been too keen on very loud fabrics, but I fell head over heels in love with the Folklorico collection from Alexander Henry. I especially like Flores De Coyoacan and Las Golondrinas. I like her International shipping deal and the Feathers in Spirit / Slub would make a terrific fabric for a tote. I love the nightfall voile, It is beautiful. I have wanted to try a voile quilt. I enjoyed looking at the different fabrics by style. I wouldn&#39;t know how to categorize some fabrics…it is fun to see what they did. Jupiter in Blue. WOW WOW WOW! So much here that I love – Mary Thistle in Seaweed is amazing! VOILE Floral Floats in Fresh for a summer dress or one of the echinachea prints. I love Bari J&#39;s new fabrics. Thanks for the wonderful chance to win! So many great ones to choose from. I really like Arizona. I&#39;m really loving Dream in Vintage right now. Selection, Pricing, Organization…. love it all! Love leaf press and the new arrow prints! Checked out the new arrivals. The year of the deer just keeps on giving…great fabrics, might have to check out those international shipping rates. I love the Folklorico Collection and anything in aqua. Nice website and love the shipping. I like Flock and Fretwork, and Forest Friends is fun. Love, love, love Flock in White! Beautiful website. I love the Rosemilk fabric but I also love Sienna in Persimmon! There are so any great fabrics to choose from it&#39;s hard to make a decision on just one. Thanks for a great giveaway! I love Orchard Blossoms in Autumn by Bonnie Christine, so pretty. Thanks for the giveaway. Oooh I love brambleberry and arizona! oooh! bobbie lou&#39;s has a fabulous selection of alexander henry! i love the lost at sea and the stars!!! I love everything in the Art Gallery&#39;s Limited Edition Arizona collection! Lily Pond in Navy Organic. For sure. I love Brambleberry Ridge – it is the year of the deer! I love the AMH Pretty Potent Echinacea flowers! Brambleberry Ridge is perfect for my daughter&#39;s first/new apartment!! I love Nature Walk in Twilight. So many interesting designs there! I love that she has a whole section of just anchor fabrics! Thanks for the chance. Summer Heather in Raspberry is beautiful! Thanks for the giveaway! I like the flight in white. Gold birds and a low volume print. I love Arrow in all of the colors! Thanks for the giveaway. I like Flock in Navy. BobbyLou Fabrics has a fantastic selection of nautical prints in Red,White, and Blue. Such a great standard for summer in USA. The Rustique green-yellow-blue leaves are fab! wishing Chelsea all the best with the new shop! Bobbie Lou&#39;s offers lots of really unique quilting fabric that you just don&#39;t see everywhere, but the best part is that they also offer knits too so that you can whip up a cute skirt or dress in between quilting projects. I love arrow in mint twill! I think I would love some Micheal Miller Confetti Border. I am really loving the border prints lately. I love the Rustique fabrics!….and the anchors….and the feathers… In every color! So much to choose from! I like the arrow in mint twill. Thanks for the chance! I always love the Riley Blake chevrons, but there are some great Michael Millers, too, especially Flock and Mod Fish. Thanks for the giveaway. I checked out the New Arrivals and really like the Disco Dot in Brite! I do love Rustique as you feature above, especially Yes, Deer in Navy! I loved Arrow in mint and Anchors in Ash Slub. I love the Flower Fields in Multi. So pretty. I&#39;d love some Lotus Pond. I love Emmy Grace by Bari J. Thanks for the great giveaway! I like that you can select things by colour, but I notice the Sale and Bundles tabs are empty? Not sure if my computer is having issues displaying things, but that was a little disappointing – I love seeing what kinds of things different shops put into bundles! What a beautiful selection of fabrics! I am especially drawn to the special group of girl and boy choices. Nightfall is beautiful!!! It would be an amazing queen size quilt for my master bedroom. Love it! I like the Arizona fabrics. I like the Jeni Baker fabrics. What an awesome giveaway! 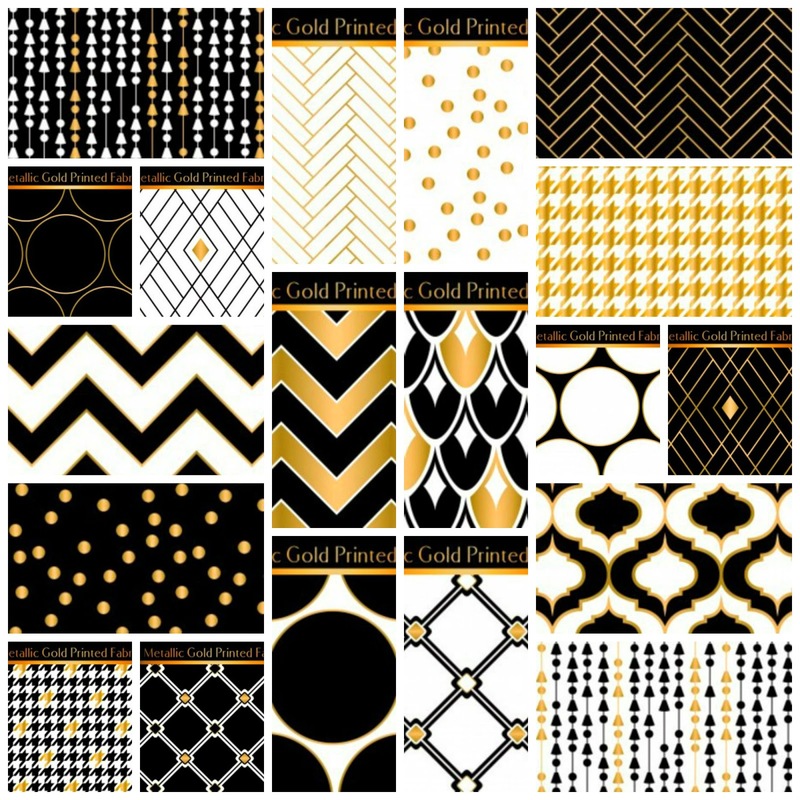 Great black and white fabrics! I love Brambleberry Ridge! Great shop and giveaway. Thank you! I like Flock in white. I like bird fabric. There are some fabrics I haven&#39;t seen before. Difficult to choose! My favourite is Wander Woods in turquoise. Thanks for the chance. Love Floral Floats in Fresh and all that coordinates with it! Oooh! Sloan and Sienna in Persimmon! And I already have a project in mind for them! Thank you for introducing us to Chelsea and her Bobbie Lou&#39;s Fabric Factory, Amy! Great giveaway! I love Jeni Baker&#39;s Dreamin Vintage. Thanks! I loved the whole shop….what a wonderful collection of fabrics! I would love to make a tote bag from the &quot;open season in multi&quot; print! Rusteque? Bad speller but oh I love this line! Deer live everywhere here! I admire the sophistication of the Nightfall collection Bobbie Lou&#39;s Fabric Factory is carrying! I like that they will sell an individual FQ, too. I like the snail trail fabric in multi organic. It&#39;s really cute! I love Frances Newcombe&#39;s Animalia ! I like Alexander Henry`s Mecca For Moderns. What a great website Bobby Lou&#39;s is! Love that I have choices on what size fabric to buy. Oh my now I&#39;m in for it! There are soo many lovelies! Nightfall, bee, ghastlies. Wow eye candy!!!!!! I really like the browns and lilacs of Brambleberry Ridge. Violet Craft is so talented. Thanks for a chance to win. What a great collection – thank you for the introduction to Bobbie Lou Fabrics… Art Gallery always has an intriguing range and I *love* their &#39;Valley&#39; design by Leah Duncan. Alexander Henry&#39;s Stockholm in Blue / Red is fabulous, too! I have bought from Chelsea before and she is great to deal with and has lovely fabrics. I love Leaf Press in Teal from the Rustique collection. I like that she has so many fabrics that I have not seen anywhere else. I also like the voile prints. I can&#39;t get over Violet Craft&#39;s Brambleberry Ridge. I am generally not a fan of metallics, but she has managed to include it in this collection in a way that really appeals to me. I love that Nightfall by Camelot fabric. Would be sooooo happy to win. Love, love the two Jupiter swatches by Kaffe Fassett. Such darling unique fabrics. 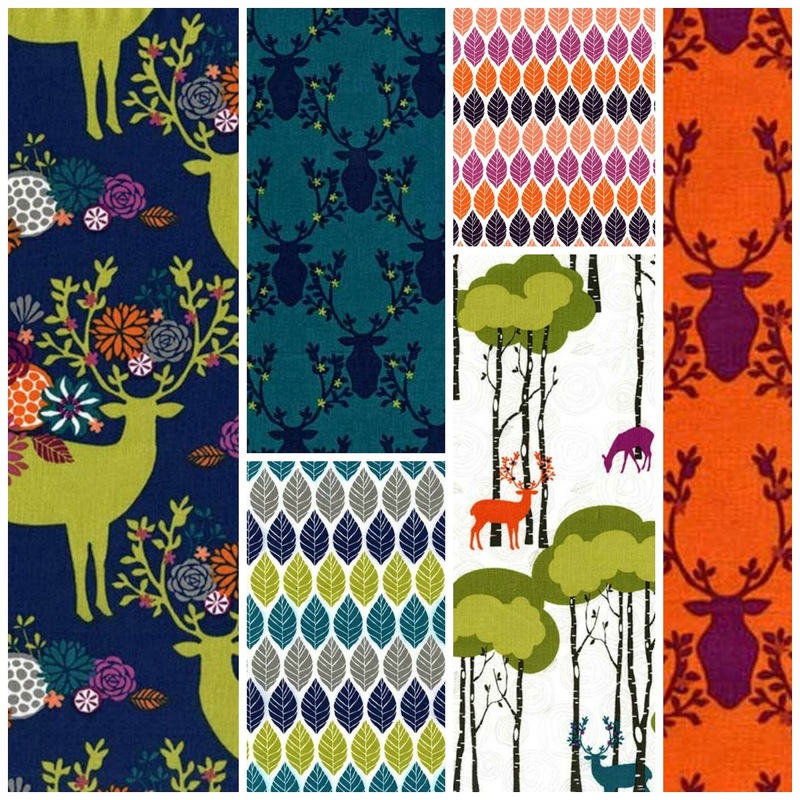 Love the deer fabrics and the brambleberry ones! Love everything – especially Swirly Girls Summer Heather! Love everything – but especially Swirly Girls Summer Heather. Thanks! Love that Rose milkl collection. How does one decide? I love the Sailor prints with all of the cute anchors. She has fabulous choices available…love Flock in White!!! I love the &quot;Style&quot; feature as a category. She has chosen the kinds of categories I wish I could search for in other shops! &quot;Faux Bois,&quot; &quot;Arrow,&quot; &quot;Baroque…&quot; These are amazing categories! I loved the animals in the Cloud 9 collection, in particular the elephants and those adorable foxes. I love the Brambleberry Ridge fabric line, particularly the Flight print in all the colours – love those birds. Thanks for the great giveaway. I just love the Rosemilk fabric in each color and the Flight fabrics. So many beautiful choices. Beautiful selections! And thrilled to know only a short drive away from me…(too bad no brick and mortar shop though….) Delighted that you (Amy) have given us a heads up about this online store! Loved Flight in Taupe and Open Season in Multi – both would fit in with our barn style home on the Little Red River we just built!!!! Ofcourse would then have to buy the coordinating and contrasting patterns as well…. Its a toss up between Timber Valley in Fog or Teal, the Jupiter swatches by Kaffe Fassett, or Foxtrot in Dusk. I look at each and think oooh I want that…. I love the Brambleberry Ridge collection from Michael Miller- I think those metallic birds are gorgeous! I really like the Brambleberry in Fog, Blossom, and Aqua. Thanks for the chance to win some. Love the &quot;ripples&quot; and &quot;stitched road&quot; fabrics! Such nice basics. echinacea in dim is such a realistic print of the fab. wonderful…….. The new website looks amazing, clean and fresh with great photography. I love that you can order fat quarters, not many vendors do that any more, and that it&#39;s so easy for me to navigate. Beautiful collection of fabrics, lovingly curated! Love love love the bramble berry ridge!! I&#39;m really liking the fabrics by Bonnie Christine. Especially those bees! The Wee Wander collection is on my wish list, let&#39;s dream!!! I really love Lotus Pond by Cloud 9, especially those cute snails!!! Thanks. I didn&#39;t have to look any further than the Nightfall you posted–absolutely gorgeous! And what a great fabric shop I knew NOTHING about. How cool! I&#39;m loving the Flock in White. Thanks for the introduction! Bee Sweet in Morning. The whole collection is so beautiful!!!! I love Stockholm in Teal! Oh, gee! I can&#39;t begin to decide what I like the most. My swatches page is half the site. Querida in Spice, Patio Lights in Multi, Timber Valley in Lilac, Marrakech in Blossom, Native Band in Jade – oh, I can&#39;t decide! I love Flight and Echinacea! Also love the ability to order 1/4 yard cuts. And the uniqueness of her fabrics!<br />Thank you. Nightfall is pretty modern thanks for the chance to win. I love the brambleberry print – especially in Aqua! I love the fabrics in the Sweet as Honey collection. I love flight in orchid. The purple is just so cheery! I really like the Yes Deer in Navy &amp; the Candy Claus. Cute site! I would pick pretty potent, Arizona, and metallic dots! Thanks for the giveaway! I love the Nightfall collection! I love Art Gallery&#39;s Limited Edition Arizona collection. Thanks for the chance! I love the deer fabric. There are so many lovely fabrics…. But what caught my eye was Baile de Calaveras in Tea!!! I love the Brambleberry Ridge, especially Timber Valley! Aurora borealis actually reminds be of Jelly rolls seen from above! But one of my favorites what the &#39;les amis&#39; print, that would make a great backing fabric! I love Brambleberry in Blossom, by Michael Miller. I love Mod Fish in blue! Love shop. Thanks for letting us know about it. I sure could use some Wee Wander. I need to make a gift for a Christening! Wow! Stockholm in Blue/Red is fantastic! Any of the Mecca for Moderns is calling to me! I LOVE Snail Trail. Sooo cute. I would be so happy to win. Thanks so much. I love the Lotus Drops in Turquoise 🙂 Thanks! The distinctive Nightfall prints are lovely. SEW perfect in my next quilt. I have two favorite collections….the Arizona collection as well as the Arrows (in all the colors!). I&#39;m still trying to resist Dreaming Vintage by Jeni Baker, but if I win…<br />She has tons that I love, actually. Absolutely love Confetti dots and their shipping rates to Australia are very reasonable too. I have signed up for their news latter. More temptation! Fretwork &amp; Herringbone caught my eye for sure.. very modern indeed! How cute is Don&#39;t Let the Birds Do the Dishes?!!! Thanks for a great giveaway. I liked the Michael Miller prints especially Tree Lights in rose. Thanks for the chance to win. My favorites on the site are from Michael Miller….beautiful bird and animal prints. Thanks so much for the heads up on Bobbie Lou&#39;s. What a great shop. It was tough to pick one, but the Sujata in Pink by Dena Designs was gorgeous! I would love to win and get six half yard cuts, too. Thanks. There is a lot to love over there, but the Michael Miller&#39;s Confetti border pearlized in blush, mist and confection has me intrigued! I&#39;ve been dying to get my hands on the Arizona line by April Rhodes. Looks like she has the whole line. Hope it is still available once I&#39;ve saved my pennies. I really like the Michael Miller Candy Claus in Aqua. Very unique. Wonderful website. Congratulations! I love the crisp, colorful fabrics. Love the selection of fabrics. There is so much to love there. Tonight I&#39;m wishing I had some Brambleberry Ridge. Those dear are elegant and still adorable. The new arrivals are great – &#39;arrow in mint twill&#39;, looks good. I LOVE the timber valley fabrics in particular. Those colors, metallics, animals, oh my! I also just love that you can buy separate fat quarters! That&#39;s amazing! What an awesome shop- I love the clean, fresh look of it! And what a cool feature to be able to save and drag the fabric swatches! It&#39;s kind of hard to pick a favorite but I do love the Cloud 9 fabrics and the new arrivals have got me dreaming:). I like Flock in white and Foxtrot in dusk. I love the shop&#39;s organization. Especially the metallics section. Thanks for the giveaway! I love the Blue Flip Flop and Swim Accessories Fabric. It would make a fun summer quilt. Love the Flight in Orchard and Flock in Navy by Michael Miller! I like the Indian Summer fabrics by Art Gallery. Thanks for the chance! I love all things Michael Miller. Thanks for the chance to win. It would take me a long time to pick out just three yards here. For now, I will say, &quot;Flight.&quot; I know it&#39;s cliche (in some circles) to go with bird prints all the time, but I LIKE THEM! I love Art Gallery&#39;s Safari Moon! Thanks for the giveaway! I love the Leaf Press in Teal and the Arrow in Cool Grey! I&#39;m liking the Michael Miller Flight. Pretty much anything with birds or deer. What a fabulous selection 🙂 Thanks for the chance to win! So difficult to make a choice. Any collection with teak appeals to me. I heart all the Rustique. I like Kasper and Ripples. I&#39;m glad they have moved from Etsy–I find the number of pages to crawl through on many Etsy sites is too long. There are probably more fabrics I would like but I could only get &quot;New Arrivals&quot; to work. No other tabs would open. I&#39;ll check back later. I really like Leaf Press in Teal among other new fabrics. What a great selection she has!!! it was hard to pick just one, but stitched road in beryl was one of my favorites! Tula Pink or Valori Wells, so gorgeous. Thanks. Rustique!! My LQS isn&#39;t getting this line and I love it so much! Love leaf press in both plum and teal! The &#39;flight&#39; series, I love them! The bright Michael Miller, &quot;Aurora Borealis in Forest&quot;<br />Contains my fav signature colors.<br />Thank you Amy, for the opportunity and sharing w/us. I love the Emmy Grace line from Art Gallery. It looks amazing! Thanks so much for the opportunity! I love the flip flops in blue fabric. Very appropriate for summer. So much to love! But can we discuss the gift certificates?! Because really, my extended family has no clue about fabric beyond that I like it. I love the echinacea prints, lovely! I love Dreamin&#39; Vintage by Jeni Baker. Wow! Fantastic fabric to choose from! I love Woodland by Sarah Watson, just to pick one! What a great giveaway! I absolutely love Bobbie Lou&#39;s and Chelsea. Quick shipping and great selection! I have a bunch of Violet Craft&#39;s Brambleberry Ridge in my cart now to buy later this afternoon. The colors are just beautiful and dreamy! Thanks for the chance to win! I haven&#39;t seen Flock by MM before, I might have to have that. oh my goodness…I have been sitting here staring at the Brambleberry fabrics for an embarrassingly long time LOL. I NEED that fabric! I would love to snag some of the Brambleberry Ridge! Michael Miller&#39;s 20/20. I have always wanted to use a fabric with glasses. Thanks for the giveaway! Love all of them, but I need that Flock in White. Perfect for a new project I haven&#39;t started yet. Love the Michael Miller selections and also Brambleberry. the Dia De Los Muertos collection is calling me! What a great selection of fabric! Love the Flower fields in multi. The website design looks great too. Oh she has Dreaming Vintage. I love that and it is on my wish list already. Thanks for the chance to win it. I love Leaf Press in Teal. So pretty! Jupiter in mAlichite, love. I&#39;d be so excited to win a stash enhancement. You did say make a list right?? Amazing fabrics! I love the ropes ends, 20/20 glasses, Marrakech, arrows and bicycles. I could go on and on! I would LOVE to win this amazing giveaway! Thank you for the opportunity! I love all the arrow prints from Premier Prints! I love all the deer popping up in new fabric! Yes, Deer in navy is a favorite. Love Stitched Road in Beryl!